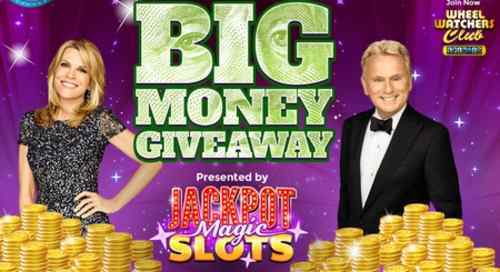 Wheel of Fortune Big Money Giveaway: Wheel of Fortune in association with Jackpot Magic Slots has come up with another exciting Wheel of Fortune Big Money Sweepstakes from which you could win whatever Big Winner Take Home from Wheel of Fortune. From 16th April 2018 to 20th April 2018, each night’s big winner is also playing for someone at home. If you’re a Wheel Watchers Club member, it could be YOU! Tune in each night with your SPIN ID, and you could win BIG MONEY from WheelofFortune.com Big Money Giveaway. Update: Winning Spin Id for 20th April 2018 is announced. We have added the Winning Spin ID as well as Winning Amount of 20th April 2018 in the Post. Check Now! How to Enter Wheel of Fortune Big Money Giveaway? 2. During Each Show, One Spin ID will be aired in the Show as Winning Number. 3. If you are lucky enough and its your Spin ID, then sign in to your Wheel of Fortune Account and complete the instructions to verify it. 4. Once your Spin ID will be verified with Winning number, Wheel of Fortune Call you to inform that you’ve have Wheel of Fortune Big Money Contest. Note:- You can only participate in this WOF Big Money Giveaway if you have joined or signed in between September 27, 2017 and March 26, 2018. Wheel of Fortune is an American TV game show in which there is a competition among contestants to solve word puzzles to win cash and prizes determined by spinning a giant carnival wheel.